The Governor's Highway Safety Administration recently released a nationwide assessment of all distracted driving laws at the state level across the U.S.
You can read more from the GHSA press release: "With 50 percent of the U.S. adult population now owning smartphones and the wireless industry reporting a subscription penetration rate of 102.2 percent, today the Governors Highway Safety Association (GHSA) released its second look at how states are dealing with the problem of distracted driving. The report, “2013 Distracted Driving: Survey of the States,” reveals that since 2010 more states are enacting and enforcing laws, leveraging new media to educate the motoring public, focusing on key constituency groups, and collecting data related to the problem. States continue to pass distracted driving laws. While no state fully bans all cell phone use while driving, 47 states and DC now have specific laws prohibiting various forms of distracted driving that impact most drivers. Of those states, 41 ban texting by all drivers, compared with only 28 states in 2010 (a 45 percent increase). States are stepping up enforcement. Law enforcement officers in almost every state are actively enforcing distracted driving laws, a significant change since 2010. From routine traffic patrols that include distracted driving enforcement as standard protocol, to targeted efforts focused on specific events such as Distracted Driving Awareness Month, law enforcement is cracking down on violators. At the same time, states note that enforcement officers are challenged by age-specific (e.g., bans for teen drivers only) and secondary distracted driving laws, and the complexities involved in discerning whether a motorist is actually engaged in an illegal behavior (e.g., determining if a driver is texting or dialing a phone, as the latter is permitted in most states). States are going social to educate motorists. Forty-seven states and DC are taking steps to educate the public about the threat of distracted driving, a 26 percent increase from 37 states in 2010. 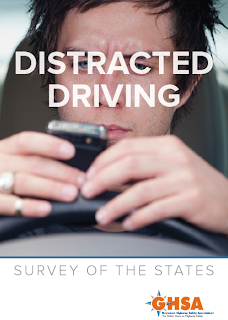 While most have developed campaign messaging unique to their states, the vast majority recognize the effectiveness of technology-based communication and are using social media including Twitter, YouTube and Facebook to get the message out about distracted driving. State use of these outreach channels has jumped 125 percent in the past three years. States are focusing on teens. With teens being the earliest and strongest adopters of new technology and the age group with the highest crash risk, 22 percent more states (27 and DC) report developing educational materials targeting teen drivers and/or their parents. This outreach includes a variety of communication channels including traditional and social media. States are emphasizing not only the dangers of cell phone use and texting, but also distraction caused by loud music and other teen passengers. Public/private partnerships increase. States recognize the power of partnering with other entities to reinforce safety messages. While the number of states working with employers remains unchanged since 2010, four states - California, Minnesota, Nebraska, and Texas - are working with state affiliates of the National Safety Council to provide education and technology-use policies to major employers. Additionally, Delaware and Kentucky have corporate outreach coordinators on staff in their highway safety offices that are responsible for working with employers. Data collection continues to improve. Accurate data is critical for determining the magnitude of the distracted driving problem and developing effective solutions that prevent crashes and save lives. Currently, 47 states and DC (up from 43 in 2010) collect distracted driving-related data via police crash reports, a slight gain in the past three years. Many states recognize the need to keep pace with rapidly changing technology and 18 states report that changes and/or upgrades to data collection efforts are planned for the coming year. Several states are also collaborating with colleges and universities to conduct observational surveys and analyze distracted driving crash data to better understand the problem. Adkins noted, however, 'States face major obstacles including a lack of funding for enforcement, media, and education. That, coupled with the motoring public’s unwillingness to put down their phones, despite disapproving of and recognizing the danger of this behavior, makes for a challenging landscape.'"